Until you have eaten freshly harvested sweet corn ripped from the plant, stripped and boiled and tehn rolled in salty butter, you haven’t lived! Sweet corn varieties have improved dramatically over the years and the newest ones deliver large gorgeous cobs from August to October. I like to start my earliest crops off by sowing the first lot in the greenhouse propagator in early March in root trainers. Sweet corn does not take well to having its roots disturbed so starting them off this way means that they can be transplanted very effectively. F1 varieties are expensive so sow one seed to each pot. Expect a few failures. With cheaper seed sow two per pot and thin out the weakest seedlings when they are about 5cms tall. Once the plants are about 15cms tall they can be planted out in to their final positions. Successional crops can be started in mid April. The main crop can be sown outside in the second week of May under cloches. 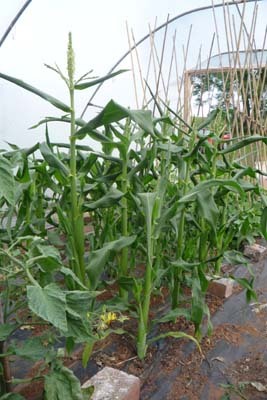 Sweet corn do incredibly well in a polytunnel because perfect pollination and with it large fully filled cobs is assured. Plant out in square block leaving 30cms between each plant. A small block of 16 plants (4 x 4) is the smallest i grow, but 20 (4 x 5) or more is fab! Under polythene the plants will grow away strongly. Once the juvenile ears form and the pollen producing fronds on the tops of the plants come out you will see great drifts of pollen falling on to the ears. Tapping each plant can be dramatic. Under no circumstance plant two different varieties close together because cross-pollination can be devastating to the quality of your crop. 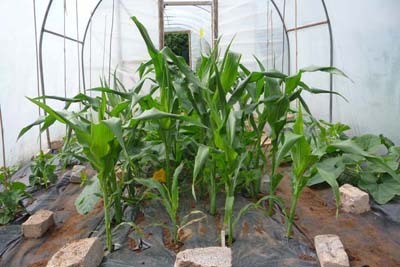 I have three polytunnels and grow three different varieties to crop over several weeks. Already the tassles are starting to grow. By the end of June everything should be pollinating like mad.